Samsung Electronics Co. has commenced mass production of the industry’s highest-capacity 12-gigabyte low power double data rate 4X (12GB LPDDR4X) volatile memory optimal to back high-performance smartphones and other mobile devices running on 5G, the company announced Wednesday. The new chip is built by combining six second-generation 10-nanometer-class 16-gigabit (Gb) LPDDR4X DRAM chips into a single 12GB DRAM package to offer 1.5 times higher capacity than the predecessor 8GB mobile DRAM commonly used for powering a ultra slim laptop, according to the company. 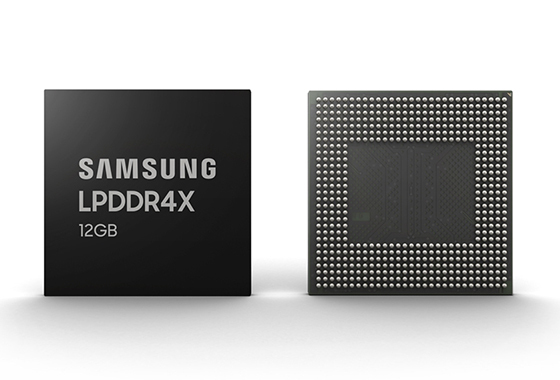 The 12GB LPDDR4X mobile DRAM will enable high-spec smartphones to run applications better and faster, claimed the company. Smartphones are becoming more advanced, featuring bigger and multi-screens, five or more camera modules, artificial and 5G capabilities. Last month, the Korean tech giant unveiled a double-screen foldable handset fitted with multiple high-end features. The company said the new chip can process data at 34.1 GB per second, the fastest for mobile devices now. The package is only 1.1 millimeters thick to facilitate slimmer mobile devices. Also, 12GB in a single package can offer higher power efficiency and bigger room for battery.